They don’t call Philadelphia “The City of Brotherly LOVE” fer nuttin’, know what I’m sayin’? 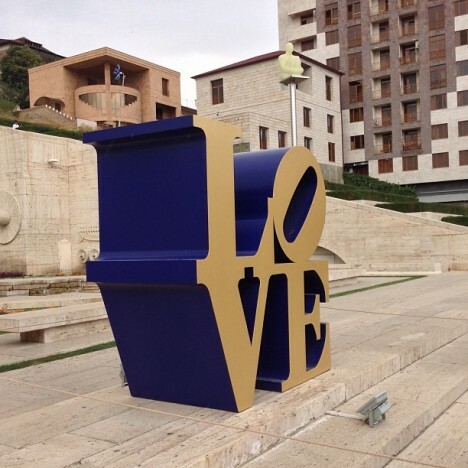 Situated in Love Park (officially JFK Plaza) at 15th Street and John F. Kennedy Blvd., this famous LOVE sculpture is one of very few such examples to be set on a raised pedestal. 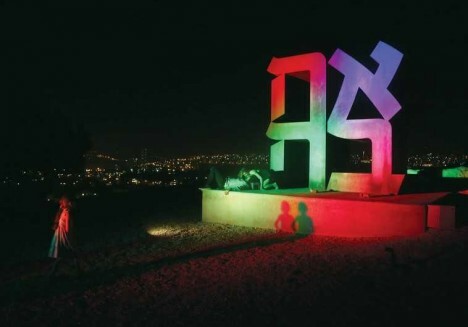 It was installed in 1976, removed in 1978, and re-installed later that same year after a public outcry. Credit Flickr users ykyangmd, Jane W (jmhw19) and Melanee Jeker for the love-ly images above. 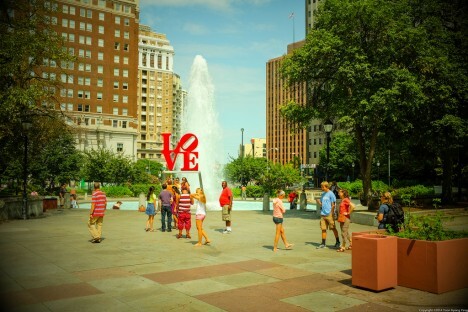 Philly’s LOVE sculpture isn’t all that big, as LOVE sculptures go, but its design is undeniably impressive. What’s more, the piece generates an aesthetic atmosphere all its own. 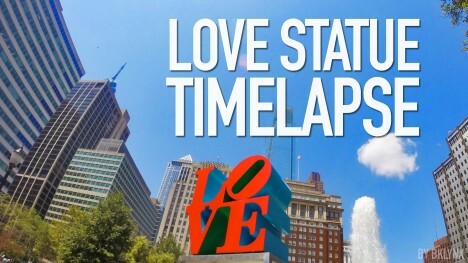 Check out YouTube user BKLYNX’s two-minute time lapse video taken at the “heart” of Love Park on August 10th, 2015. 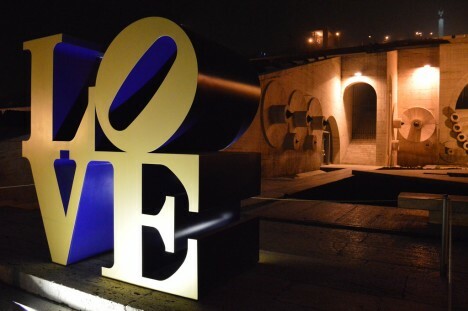 Flickr user Mark Robinson (fame&obscurity) snapped this nighttime view of the golden-faced LOVE sculpture in Yerevan, Armenia, in late 2014. The sculpture contributes some badly needed warmth to the monumental Yerevan Cascade, a Soviet-era gigantic ornamental stairway built between 1971 and 1980. Levon Hadidian‘s photo illustrates just how much the added warmth was needed. Is LOVE by any other name still the same? 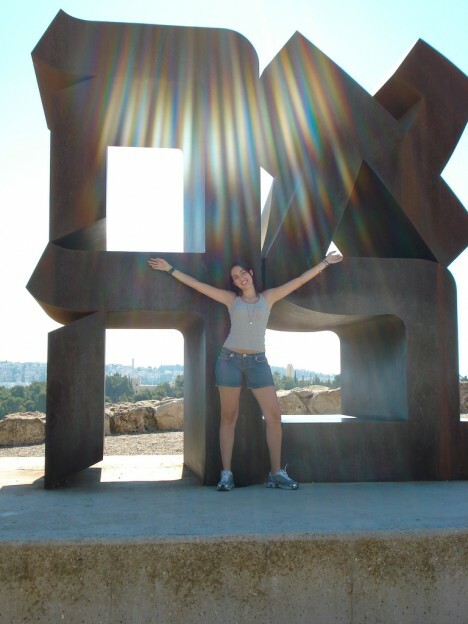 Take “AHAVA“, the Hebrew word for love, spelled out in four characters on the grounds of The Israel Museum in Jerusalem. 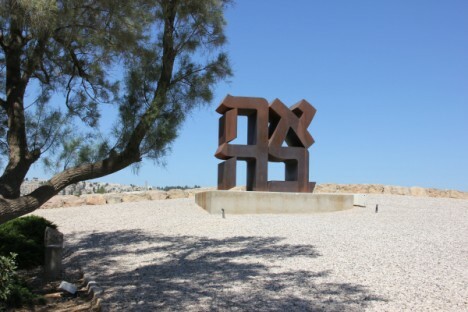 Installed in 1977 and designed by Robert Indiana himself, the piece is otherwise very similar to the artist’s original LOVE sculpture in that it’s the same size (12′ by 12′ by 6′) and is made of uncoated Cor-ten steel. 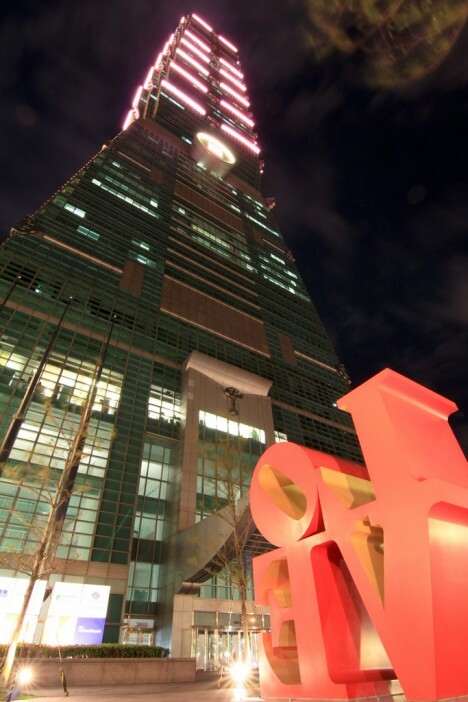 When Taipei 101, Taiwan’s 1,671 ft tall skyscraper, opened in 2004 it was accompanied by one of Robert Indiana’s LOVE sculptures. As depicted along with its super-tall companion in Flickr user Bumblebee Photography‘s 2008 image, the aluminum artwork features red-painted facades with complementary gold-toned interior highlights.